shame.’s Joe Anderson goes over Love Tractor’s Camden Kittredge in the mixed division final at the 2018 Pro Elite Challenge. Photo: Brad Cochi. During this 2018 summer and fall season, we will publish a bite-sized weekly recap of the action across the Club Division. This will serve as a supplement to our standard tournament reporting and will offer a high-level look at the latest happenings and the biggest stories of the week. I go through the annals of score reporter so you don’t have to! Want your tournament listed here? Submit a recap of what happened right here. The Pro-Elite Challenge is always a crazy tournament filled with seeding upsets and the sort of rock-paper-scissor three-way ties at the tops of pools and throughout consolation and bracket play that drive Ultiworld editors mad while trying to come up with the weekly Power Rankings. It’s early season nature and the added effects of altitude and heat may have made this year’s tournament even more chaotic than usual. Let’s see how the results shaped up and take a look at the other action from around the country. Up 5,000 ft above the sea, Colorado’s two premier mixed teams were the class of the tournament. #13 Denver Love Tractor and #14 Fort Collins shame. both took undefeated weekends into the final where the Denver squad took home the top prize with a 12-10 victory. Neither team looked invincible as both had narrow wins like shame.’s 13-12 win over Seattle Birdfruit in the first round or Love Tractor’s back-to-back one-point wins over #22 Durham Toro and #7 Minneapolis Drag’n Thrust in the quarters and semifinals. It was a disappointing weekend for number one seeded #9 Boston Wild Card who started strong going undefeated in pool play before dropping their quarterfinal to #10 San Francisco Blackbird and then falling to Toro in the fifth place game. Blackbird bounced back from a lackluster first day to make it to the semifinals but didn’t have enough left in the tank to overcome shame.’s altitude advantage or Drag’n Thrust’s depth in the third place game. For more coverage of the mixed division at the Pro Elite, check out our recap and scores. #20 West Chester Loco continued their stellar start to the season, going 7-0 at the Philly Invite with their closest game being a 13-7 win over Princeton Jughandle. 20th-seeded Toronto UNION rolled through the competition at Motown Throwdown with an impressive 8-0 record. Amherst Happy Valley took home the title at AntlerLock after upsetting no.1 seed Titan NE in the semifinals and taking down hometown Burlington Heartless in the final. The Administrators out of Willamette Valley, OR and St. Petersburg Mutiny both went 4-0 in one-day round robins at Rose City Rumble and Swan Boat, respectively. At Huckfest Florida Weird took down Nashville ‘Shine to complete an undefeated weekend, going 6-0 in Decatur. Certainly the least chaotic of the three divisions in Denver, the women’s side saw each of the three pool winners go undefeated on Saturday and make it to the semifinals on Sunday. Three of the four were not surprising at all as #3 Denver Molly Brown, #4 Seattle Riot, and #9 Washington DC Scandal all took care of business as expected. However, Pool C four seed #21 Raleigh Phoenix surprised the whole field by earning wins over#7 Vancouver Traffic, #13 Portland Schwa, and #16 Minneapolis Pop. In quarters they notched a one-point win over #12 Madison Heist before falling to Riot 13-7. They and Scandal appear to have locked in their places as teams in the second tier after the elite four and will look to build on these results going forward this season. Outside of that major surprise, the remaining games were not nearly as crazy. Molly Brown and Riot look really good and are certainly prepared for WUCC starting this weekend. They are again going to be top four teams in the women’s division but given how things ended for Riot last year, they must be anxious about the departure of Sarah Griffith in two weeks time, even though she had a sensational last domestic tournament for her longtime squad. For more coverage of the women’s division at the Pro Elite, check out our recap and scores. Birmingham Steel went 5-0 at Huckfest in Decatur, AL with wins over every other team in attendance. The score reporter for the men’s division looks more like a random number generator than an actual ultimate tournament. No team went undefeated. None of the top seeds won their pools and two of the top four seeds finished last in their pools, missing the bracket altogether. It was a wild weekend, including a halfway-finished prequarters round that was postponed to the start of Sunday, but hometown #12 Denver Johnny Bravo prevailed through the madness of it all to take home an early-season title. They started off their weekend with wins over #15 Portland Rhino Slam and #10 SoCal Condors before dropping their only game on the weekend to #6 Boston DiG; Bravo won the pool on point difference before stomping through the bracket, picking up victories over #3 Austin Doublewide, #14 Ann Arbor High Five, and #13 Pittsburgh Temper. The other big winner from the tournament was the last-seeded boys from Pittsburgh. Temper won their pool taking down #11 Minneapolis Sub Zero, High Five, and #7 New York PoNY before dispatching DiG and #5 Seattle Sockeye, both on double game point, to reach the final. PoNY, #9 Washington DC Truck Stop, and #3 Austin Doublewide have to be especially disappointed with the results, going a combined 7-12 on the weekend. 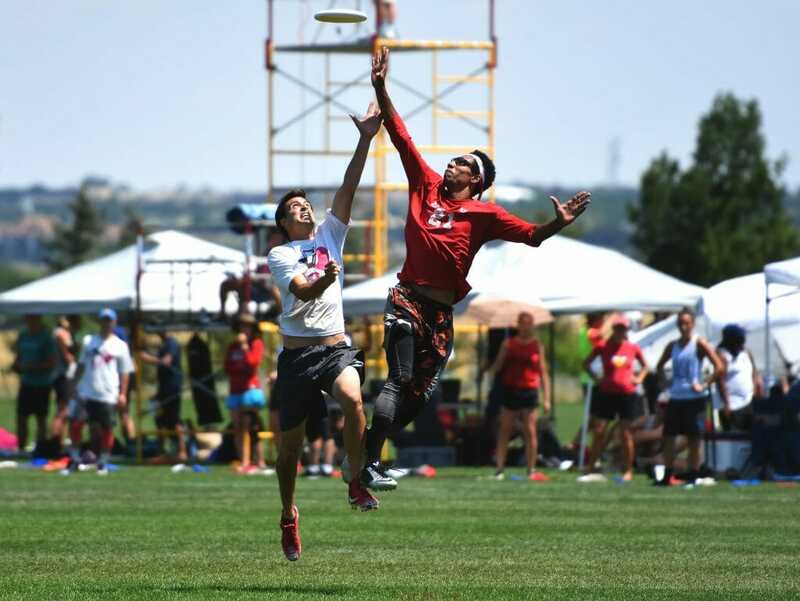 Truck Stop may need to earn the Atlantic Coast a third bid this season or risk missing Nationals and Doublewide looks to be on an uneven footing heading into WUCC next week. For more coverage of the men’s division at the Pro Elite, check out our recap and scores. In the final of San Diego Slammer, it was a matchup of the two undefeated teams at the tournament, #25 Denver Inception and San Diego Streetgang,1 with Inception taking the crown 15-11. Huntsville Freaks rode a 6-0 record to a victory at Huckfest. Saint Louis CaSTLe upset Chicago Black Market in the semifinals of Motown Throwdown on their way to a championship over Athen BroCats, 15-8. In certainly the most hilarious story of the weekend, Needham Deathsquad forfeited first place at AntlerLock; after sweeping round robin pool play, they expected their weekend was done and all but one car of Needham players had left when they found out there was a championship game scheduled. Second-seeded Westchester Magma Bears, who were following the schedule and prepared to play, “won” the tournament via forfeit. At Swan Boat, Oakland Park El Nino took down Orlando Omen 15-10 to complete an undefeated weekend. This coming weekend will be the start of the World Ultimate Club Championships in Cincinnati, OH! There will be wall-to-wall coverage of the event with numerous streamed games every day and recaps, analysis, and special team-centric reports from our own Ultiworld team, including yours truly! There are too many teams and storylines to cover in this little blurb so be sure to keep checking back as more and more previews come out leading up to Saturday’s opening ceremony! Old Line Classic, Battle for the Beltway, and Philadelphia Select Classic will feature teams from the East Coast in the Women’s, Mixed, and Men’s divisions, respectively. Tim Schoch is a Staff Writer for Ultiworld. You can reach him by email (tim.schoch@ultiworld.com). Comments on "Club Update: Wild Weekend in Mile High"